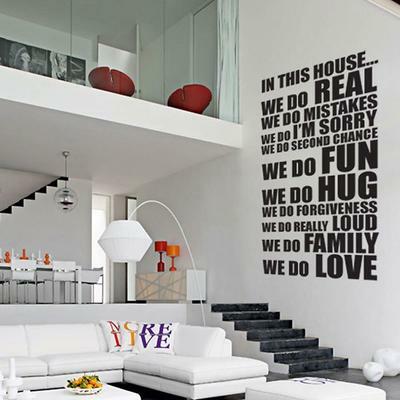 Create a visual reminder for your family and guests inside your home with this inspiring 'In This House XL Wall Sticker'. This wall decor can be placed almost anywhere inside your space. Crafted from vinyl, this one features beautiful reminders for your family and other people in the household. It's made from self-adhesive vinyl that won't ruin or damage your wall even if you decide to remove it. Each sticker is made to order so returns are not allowed unless the product is faulty. Each piece is non-reusable and made to last instead.